cara Print 4.0 offers dental professionals a faster, more economical method of producing polymer-based dental appliances in-house. Not only does it provide a cost-effective alternative to milling for certain indications, it is more competitively priced than other 3D printers on the market, while still meeting all the accuracy requirements. Digital Light Projection (DLP) makes cara Print 4.0 quicker, more economical and more accurate than laser-light technology. And it’s even faster than most other DLP systems. The intelligent calculation of the illumination sequence and the mechanical movement of the z-axis – combined with the unique properties of the tray window – speed up the manufacturing process significantly. Furthermore, cara Print 4.0 results in smoother, more homogeneous surfaces than competing 3D printers, while the long-lasting resin tray remains transparent and stable as long as it is not mechanically damaged. The cara system for 3D printing is open, working with open STL files commonly used by CAD programs, such as Dental Designer™ by 3Shape. Our cara Print CAM software is included with the purchase of cara Print 4.0, with no hidden licensing fees. Users are encouraged to use cara Print 4.0 together with Kulzer’s own dima Print materials, followed by post-curing in the HiLite Power. Doing so ensures the highest quality results and guaranteed clinical performance. Take the next step and secure your place in the future of digital dentistry – with cara Print 4.0 .
cara Print 4.0 allows you to accelerate the production of high-quality polymer-based dental applications. With an X-Y resolution of 53.6μm and a variable layer thickness (i.e. 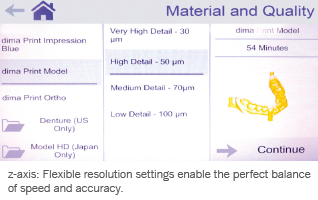 Z-axis resolution) of 30-150μm, you can quickly achieve the accuracy requirements for all polymer-based restorations. Digital Light Projection makes cara Print 4.0 quicker, more economical and more accurate than laser light technology. cara Print 4.0 can deliver highly uniform and aesthetic surfaces that are unattainable using laser technology. Laser-based resin 3D printers have to ‘trace’ each layer, point for point, line for line. With its DLP technology, on the other hand, cara Print 4.0 can project an entire layer in a single flash and achieve a finer level of detail than with laser. This means greater precision, faster production and smooth, homogeneous surfaces. Unlike many other 3D printers, cara Print 4.0 automatically adapts print speed according to the accuracy requirements of the current layer, often reaching speeds in excess of 100 mm/hour (e.g. when printing temporary support structures). The ability to vary layer thickness means that you can select the optimal balance of accuracy and speed. This makes it possible to optimize the process for appliances that don’t have high accuracy requirements (e.g. 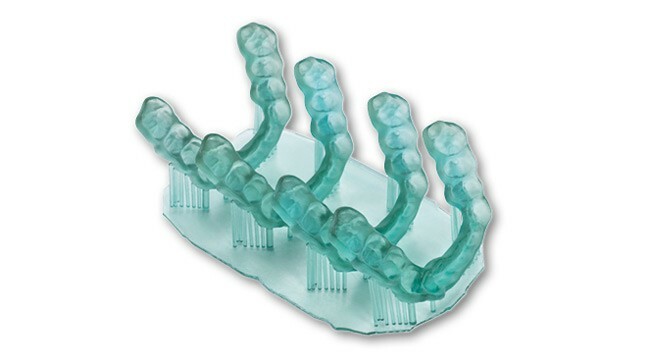 impression trays) by increasing the layer thickness and thereby reducing build time. Our printed denture solution offers you custom options with 6 dentrue base and 6 teeth shades, all are FDA approved! 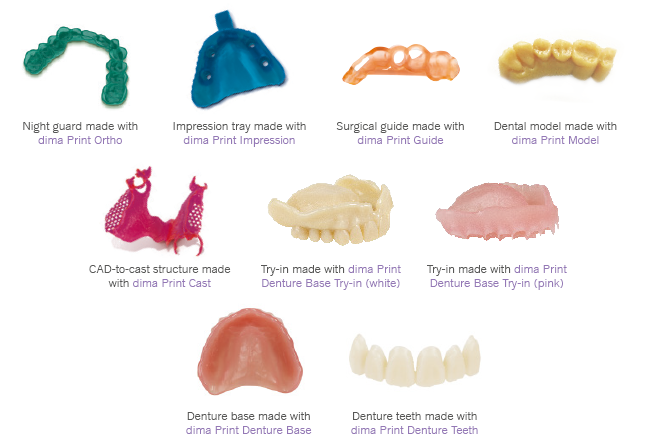 See how quick and easy it is to assemble printed teeth and a base to create a fully printed denture. Want to know more about dima Print materials? HiLite Power 3D is a high-performance light-polymerization unit, necessary for the post-curing of additive manufactured objects. The resin tray is one of the big secrets to the exceptional speed of cara Print 4.0. The non-clouding (fogless) and non-reactive design of the resin tray means that each new layer can be quickly and easily lifted off the surface of the tray, substantially increasing build speed and the overall surface quality on the z-axis. For cost calculations, we generally assume these trays will last for approximately 600 prints. However, since the tray never actually clouds, it can be used indefinitely or at least until it is subjected to external damage. Compare that to the industry-standard PDMS trays, which only last for about 15 prints and lead to much higher long-term costs and lower quality. Two resin trays are included with the purchase of cara Print 4.0. The building area (103x58x130mm) has enough space for up to 4 splints or 2 dental models. And the resins can be exchanged in less than one minute by exchanging the complete tray. If you need to add more of your current material, it’s as easy as pouring liquid from a bottle. cara Print CAM software is included with the purchase of cara Print 4.0 – with no hidden licensing fees. The user-friendly software serves two functions. First, as a print manager, it integrates the printer into your local network and manages the file transfer. Second, as a print editor, it allows you to orient and position appliances, as well as to add support structures. In short, it prepares the digital file for printing. It operates with open STL files, provided by dental CAD software of your choice, such as Dental System (3Shape), DentalCAD (exocad) or DWOS CAD (Dental Wings).